Seems that Kylie Minogue isn’t the only person celebrating a birthday today… Whereas our homegrown princess of pop turns the big “four four”, auspOp is today turning the big “four”. Yes, on this day four years ago, we kicked off a certain lil’ pop express with a review of the Cyndi Lauper album ‘Bring Ya To The Brink’. Four years and almost 8000 stories later, we’re still kicking on – bringing you the very latest in pop information all with a distinctly Australian flavour. Our information is (and always has been) sourced directly from the record and touring companies, publicists and agents, because we aim always for accuracy. No bum steers here. Our sole wish is to bring you short, sharp bursts of credible pop information. In our fourth year, we’ve once again brought you some big name pop interviews – chats with Wynter Gordon, Zoë Badwi, Havana Brown, Anthony Callea, Ricki-Lee, Emily Williams and recently with Reece Mastin, Olly Murs and US superstar outfit Fun. Plus there have been the Q&As with the likes of Natalie Bassingthwaighte, Chris Sebastian, Timomatic and most recently US country megastar Carrie Underwood. To celebrate our fourth birthday, we’ll be pulling out all the stops this week with more big name interviews, kicking off later today with the gorgeous Marina & The Diamonds! There’s another interview standing by later in the week too – this time with an Aussie pop god! To our Twitter followers… Thankyou. You’ve been so extremely dedicated to us since we launched on the platform just over two years ago. Thanks for the retweets, the favouriting, the #FFing, the messages (both public and private). We couldn’t do it without you. To our Facebook fandom… Thanks for joining the ride! You ‘Like’ us! You really ‘Like’ us! We only launched on Facebook a year ago today, but we’re thrilled that you’ve decided to join us and hope you enjoy our regular updates, exclusive nuggets of pop info and little teasers. To our RSS subscribers… You’re part of very elite company, you know. Thankyou especially for loving us to the point of wanting to know everything we have to offer. You’re a bit special. 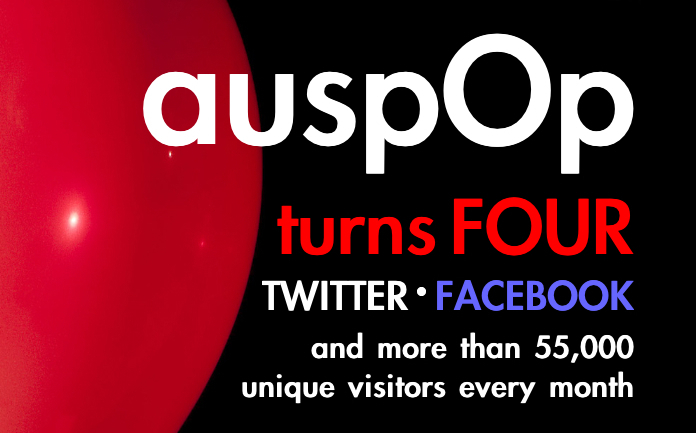 To our supporters… You’ve been so extremely generous with your time, energy and enthusiasm for auspOp since its inception four years ago. Your support and content has helped us along to the point where we’re now garnering more than 55,000 unique visitors each and every month. To our readers… You are basically the reason this site keeps going today. Your support, participation, visits, comments, questions, emails, competition entries, sharing and caring constantly floors us and we’re forever grateful. Remember, the bigger we get, the more information, the more big name interviews and better prizes we can bring to you! So keep sharing that auspOp love with your friends, colleagues and family by word of mouth, on Facebook, on Twitter… and help us grow! Keep your eyes peeled for the Marina & The Diamonds interview going live today, plus the first in a range of awesome prizes we’ve got ready to go this week to celebrate our fourth birthday. And again, thanks always for your support. Congratulations. We all appreciate the hard work that goes into doing this. 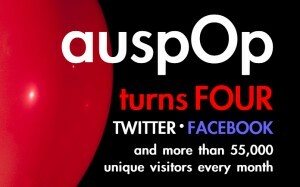 Happy Birthday Auspop- thanks for answering all my nerdy questions! Happy Birthday to the team at AuspOp. Thank you for a fantastic year of music info, free music and awesome giveaways. Looking forward to another year! WOO! Happy birthday to the best blog online, no mess, just fact! Happy Birthday to ya, happy birthday! The big FOUR hey? You know, websites should really have their own birthday systems, similar to dogs. Especially one as quality as AuspOp. You’ve definately posted enough brilliant news and competitions to match 28 years of lifetime. And as a Twitter follower, Facebook liker and RSS feed subscriber, does that put me into the “addict” category? Here’s to the next 4 / 28 years!